Jaime Murray brings a level of charm, class, and intelligence to all of her roles, but in the case of Stahma Tarr, in Showcase’s Defiance, she turns intelligence into pure and almost frightening cunning. The English-born actress, who also plays H.G. Wells in the series Warehouse 13, also starred in Dexter, and Ringer, before she landed the role in the new Toronto-based series, Defiance, which also features Grant Bowler, Julie Benz, Mia Kirshner, Stephanie Leonidas, Tony Curran, and Graham Greene. Set on Earth in the year 2046, after the planet has been wildly transformed after a group of seven alien races fought with humans for control, and squatting rights, Defiance is practically a period Western drama. Once the dust settled, after uncontrolled terraforming, Earth was like a new, wild frontier, leaving the humans and aliens in a hostile environment that has forced them to group together to survive. At the centre of one of those groups of aliens and humans is the town of Defiance–formerly St. Louis, Missouri–where life always seems to be interesting as the settlers battle for survival against outside forces, while forces inside vie for control over the fledgling city. Recently, actress Jaime Murray chatted with press about her work on Defiance, and here’s what she had to say about the series, her character, and some of her roles on other shows. 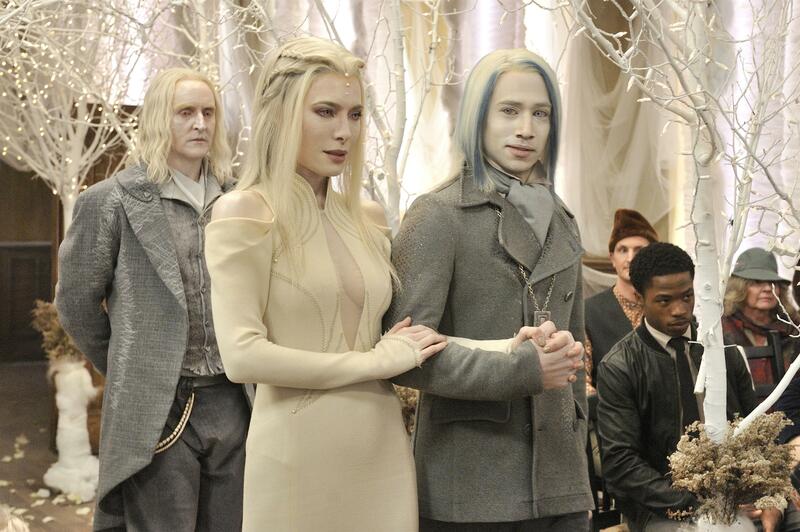 Catch the finale of Defiance on Showcase this Monday, July 8 at 10:00 PM (ET/PT). Question: What attracted you to star on Defiance? Question: After playing H.G. Wells on Warehouse 13, Lila on Dexter, and now Stahma, do you have a favorite character? Question: Did H. G. Wells influence how you played the role of Stahma for Defiance? Question: Now that you’ve worked with American crews and Canadian crews, what do you find the differences are behind the scenes? Question: What I’ve really, really loved with your character on Defiance is how she’s hinted at kind of being a bit of a puppet master so to say. Will we be seeing a little bit more of how Stahma may be the person calling the shots? Question: Considering the marriage between you’re character’s son, Alak, and Christie, does Stahma really like the future bride of her son? Question: What is it like to work with Tony Curran who plays Datak Tarr? Question: You’re going to be in a horror movie coming up, can you talk about that? W. Andrew Powell lives, sleeps, eats, and breaths movies and entertainment. Since launching The GATE in 1999 Andrew has enjoyed being a pest to any publicist who would return his calls. In his "spare time," Andrew is also an avid photographer, and writes about leisure travel and hotels around the world.